The lanchita Ferry connects bayside Old Havana with the colonial town of Regla, famous for its black virgin that attracts pilgrims from all over each and every September. Once a month, believers from different parts of Regla and far flung neighborhoods like 10 de octubre, San Miguel del Padrón, La Lisa, and Mantilla also climb onto the ferry to make the pilgrimage to Regla. But upon disembarking in Regla they walk past the famous Catholic church which houses the Virgin of Regla. They are believers of a different breed. Among them are representatives of the five manifestations of Hip Hop: rappers, breakdancers, DJs, graffiti artists and people tuned into the spiritual and intellectual aims of the movement and they are coming to Regla on this warm September afternoon to join an open mic organized by Magia Lopez and Alexey Rodriguez members of Obsesión, Cuba’s longest lasting Hip Hop duo. This year Obsesión celebrated its 20th anniversary, and I made the pilgrimage to Regla to sit down with Magia and Alexey and learn more about their current projects. La Habana.com: Many artists and Hip Hop commentators who participate in the movement on the island and beyond point to your group as a model for the quality of your music and your role as artivists. Can you tell us a little about how you decided to celebrate these 20 years? Magia: We have spent our career not only producing music and writing lyrics but also participating in activism and art about subjects that are difficult to deal with: gender and race. We’ve organized all kinds of events and concerts and we knew that for our anniversary we had to do something special. We ended up with a three day event hosted by the Casa de Africa, a museum in old Havana. Alexey: It was really gratifying to hear so many people, from specialists to people from the neighborhoods, talk about the impact of our group. We did a concert that was produced by Fonseca which was really special because he produced our first album in 1999. It was like closing one door and opening another. Now that the celebration and all the work of organizing it are over we are entering a new stage as a group. LaHabana.com: Can you tell us a little about what this new stage is about? Magia: This new stage will be a difficult one and that has to do with the times that were living in. We’re trying to insert ourselves into these new economic opportunities that the country is offering, but from our base in hip-hop. We are thinking about visitors who are coming to our country and we want to preserve our culture and make sure we are not lost as the country reorients itself. We want to highlight the historical contributions of blacks and mestizos in Cuba that are often lost in the way that our country is presented for tourists. So far we’ve done some presentations for student groups and socially conscious tourists and hope to do more. Alexey: We want to “give color” to this vision that is being shown that the everyday seems is more “whitened”. We have a project that is called the Club del Espendrum (The ‘Fro Club), together with Roberto Zurbano, and two lawyers active in the Alianza Unidad Racial (Racial Unity Alliance). In the US, the same thing happens in the way history is taught. We’re always blaming the government for what they didn’t do, and what they need to do, but I think it’s also time for popular initiatives to do something as well. Rather than the tendency towards paternalism and waiting for the state to do it for us, it’s time for us to do this on our own. Magia: We’re also looking to do more shows in the provinces. It is different than working in Havana, it can be pretty difficult. We want to maintain a connection to support local artists and know what’s going on in other parts of the country. We’ve been invited to a festival in Las Tunas in November. These can be great spaces to meet other artists from other art forms. Sometimes rappers are stigmatized, but we’ve also met a lot of people who really value what is being done in hip-hop. They’re out there, in the media and they’re within the organizations, and we have to find them. This is a problem not only for hip-hop artists, but in other genres as well, because in this day and age it is difficult to get exposure for “thinking music”, and intelligent lyrics. Alexey: Sometimes we complain about the media, “They don’t play our music on the radio or help us promote it” but that’s not 100% true. There are people inside who are willing to take the risks and even hit up against the wall hard. Sometimes we censor ourselves because we think, “This is not to get played” and they surprise us and say, “Give it to me, I’ll put it on”. 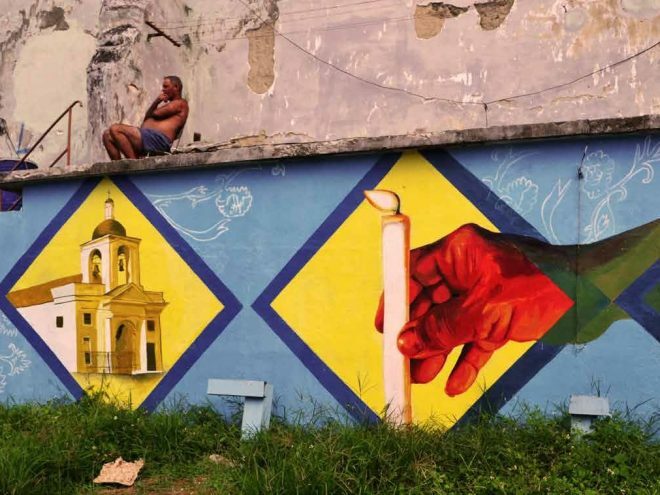 LaHabana.com: Can you tell us a little about your plans to create a cultural center? Magia: For years we’ve been doing this work all over. This apartment used to be our base, but it’s not the same when you have four people living here as it is when the family begins to grow. And the ideas are growing too, and they don’t fit in this living room. In 2013 we did a US tour and we visited a lot of cultural centers and saw how these spaces helped to bring together movements. A place where people can come together to listen to music, read books, have workshops, and a space for the elderly to have their own activities. Now there is a real estate boom here in Cuba and everything is being bought up so quickly that if we don’t act fast we won’t ever be able to afford anything, so we are looking for financing. Alexey: Here in Regla there are very few cultural options. The cultural center could also be a space that can create employment in the community, and get youth involved. We want to promote the history of black people in Cuba because our young people are growing up with an idea of our past that is not complete. They’re not able to learn about the contributions that people of all colors have made to our country. That’s what we want to achieve in this new stage. As we wrapped up our conversation, the sounds of Cuban hip hop wafted through the open windows from the empty lot next door. I headed downstairs with Magia and Alexey and observed as they organized the list of performers, young people from all over the city, and even a couple visiting spoken word artists from Costa Rica and Puerto Rico.